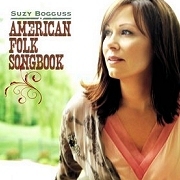 Suzy Bogguss is one of the most beloved country artists. In the 90's she scored hits such as "Outbound Plane", "Drive South", "Hey Cinderella" and "Letting Go". 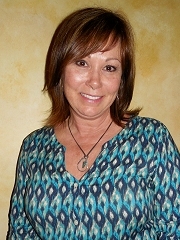 Suzy brought quite a unique style in country music as her songs have been often influenced by cowboy songs and folk music. She has never feared to try new things and some of the notable projects include a swing album, a traditional folk album as well as a tribute album to Merle Haggard. 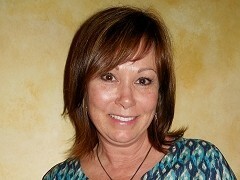 I met lovely Suzy at a coffee shop in downtown Nashville and we talked about her roots, career and music. In your music there's always been a strong influence of cowboy music. Is it because of your family's friendship with Roy Rogers? "Yes, a lot of it. And also, I think, when I was a kid, we just had a couple of TV stations and on Saturday mornings they would be mixed up cowboy shows and cartoons. So you watched the cartoons until they ended and then the cowboys shows started. So even in a very young age I desired to ride horses and to see some really open space. I grew up in cornfields in Illinois and we had a lot of horses out there. A lot more work horses, big work horses and I'd go to my friends' houses and ride their horses. We lived in a town, so we didn't need any horses." What is your fondest memory of Roy Rogers? "My very favorite of Roy is in the sixth grade, I was 12 years old and I took the train out and visited my grandparents, who lived very close to Roy and Dale and my uncle was in the same block as well. There were four corners of a block and I got to go over to Roy and Dale's house and have TV dinners with them. And their daughter Dottie was still living in their home. She was probably 15 or 16 at the time. It was a real big deal for me, because I kind of got to hang out with her and they treated me like I was family. It was pretty neat." The very first album of yours that I heard was Simpatico and I remember how blown away I was with the video for "One More For The Road". 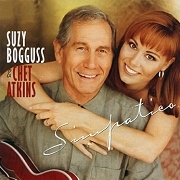 What is your favorite memory of Chet? "Oh gosh. I was very close with Chet, so I have lots of, lots of memories. I think one of my favorite ones is probably how I met him, which was on the Ralph Emery show. It was my first time on television and Ralph invited me on the show, because I was performing at Dollywood. And Chet had already performed, so I sat down on the couch and he had been given a flyswatter, something to smack the bugs with, from someone in the audience. And I was very nervous and I kept tapping my feet on the ground and it was making the couch go up and down from me being so nervous and he slapped me on my knee with the flyswatter and told me to calm down. And that was the way that I met Chet and from that point we were best friends." I also love the Swing album that you did. Some time ago I interviewed Ray Benson, who produced this record. We talked about it and he said that he was sorry he didn't get to see you that often anymore. He literally said that you had done the album and disappeared. "He said that I did that and disappeared?" (laughs) "You know, with him living in Austin and we living up here in Nashville it's really hard. And he's on the road a lot, more than me, so that's been the kind of a thing. I really wanted desperately for us to do some touring together with that record, maybe we'll still get it done." They're just working on the second Willie Nelson at the Wheel album. Would you like to do one more album with him? "Yeah, I would. We had a good time and it was very live kind of recording. We were in the same room in the same time, except for the drummer, you know." What influenced the choice of songs for the American Folk Songbook? "That is really kind of a tribute to my school and my music programme in my school. When I was about ten years old, we had a teacher that was just really passionate about music. And we had a book that was loosely based on American building, the way that America was built. A lot of the songs were sort of attached to the stories about pushing west or the iron workers. Erie Canal is a song about how they tied the country together, so they could get products across. So we were kind of getting a history lesson at the same time we were getting a music lesson. And me that I loved music as much as I did, it seems fun to me that I didn't know I was learning as much as I was." "One of the school programmes now, the arts programmes are being sort of cut from budgets and stuff, which is really a shame. This is gonna a big mistake and I think they're gonna find out eventually that it's a bad thing. I think it's not a bad thing to concentrate on trying to teach the kids better arithmetic, science and stuff, but it's a bad idea to leave out something as profound as music is to a person‘s soul. I mean it's important that you also have that side of you that's being developed at the same time as your other brain stuff. Over the past ten years you have been releasing your albums on your own label. What do you see as the biggest advantage and disadvantage of being independent? "Well, I came off the Capital in '99 and I really felt like I just want to think about what I want to do next. 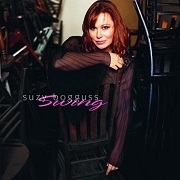 If I want to do a swing album, I can do it. If I want to do a folk album, I can do it. Or jazz or whatever I want to do. And I also started out with this camper truck and driving around the country and just selling my records out of my car. There was something about coming full circle like being a small business myself and not having a lot of overhead and worries of like 'can I have everybody working and happy?' because it sort of takes away from the actual expression in your craft. And this way I was kind of back to just playing concerts and making albums. When it was time to make a record, I was ready to do it. I had nobody telling me what time line I was on. I just felt simple and I think that's one of the best things about it." "Of course, one of the bad things is it's harder to get the word out. You have a new product and there's so many people making music right now. There always has been but nowadays it's more of an equal playing field. You gotta do something to try to get people's attention so they can actually see you have a new product down there." Are you big into social media like Facebook and Twitter? "I do. Actually I'm just getting the hang of it. I've been tweeting for about a year and I really like that a lot, because it's very short and spontaneous and it doesn't take a lot of preparation. And I actually do feel sort of a connection that way. Facebook is now taking a different place for me now. I used to get a little overwhelmed with all that blogging and all that kind of stuff. But now it's a shorter kind of connection I'm really finding myself feeling more compeled to keep in touch with those people even though it's a lot of people on Facebook. It used to just make me feel guilty I don't have time to write to each single person, but now I feel like they're not really asking me to do that, they're just asking me to stay in touch with them. It's not so overwhelming to me." Do you think it is important for artists today to be in personal touch with the fans? "And also I think one of the things I got at the beginning in my carreer, where I was sitting and talking to people, was that they would also give me material and people to listen to. There was a sharing of 'hey if you like this, you'll probably like this'. And now I think there's more of that in social media. You really are trading things there, there's an interaction and a kind of a communication that happens there as well. It used to have to be one hand to the other hand. I still enjoy that part of the accessibility that people say 'have you seen this?' or 'have you heard this?' and I go and find out about it. When I was kind of put away from everybody else and it was like being captive. It was like 'it's not safe for you to be out there among those thousands of people', so I'd rather be with hundreds of people, because I feel safe." I think it's possible to be in touch with people to a certain level, but once you get hundreds of thousands fans, then it's only one-way communication. "Right, and you just kind of hope that they've got enough in common at that point you just tell them what you're up to and hope that they understand and they're still happy for you to have that success instead of feeling like now I'm left out the deal." Do you still design clothes and jewellery? "I might to, but I don't have a lot of time to do it. I took some classes at Vanderbilt last year and had a blast. I took some jewellery classes, which I hadn't done in years and years. I was almost starting over again. It was really fun to have torches and hammers and all those good things that you get to work with silver, copper, metal and stuff like that. I enjoyed it." Have you managed to combine these skills with your musical carreer in any way? "I think my background in art helps me sometimes to have a little bit of an eye for design and things like that. When I was really having to come up with outfits all the time, I think it really helped me as far as designing stuff that I could have made for me at the time. And I still mess around. A lot of times I buy something and then I alter it and change it instead of starting from scratch, that takes a lot of time." How many times have you toured Europe? "I haven't done Europe so much. I've to the UK a lot, the last few years I've been there every year for maybe six seven years. Just recently I was working in Switzerland and Spain and Italy and I got to do a show in Krakow. I think that's the closest I've gotten where you live. But we've done Switzerland several times, they're very big on country music there. And I worked in Germany, I did a show in Sweden and Denmark. But we need to get where you are." That'll be great. OK, thank you for the interview. 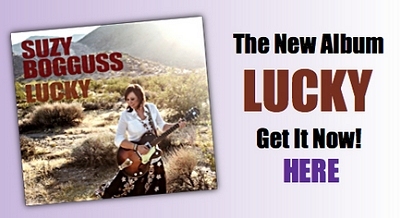 Suzy Bogguss - "Letting Go"
Suzy Bogguss - "I Wanna Be A Cowboy's Sweetheart"
BUY SUZY'S LATEST ALBUM "LUCKY"
(C) Petr Mecir 2015. All rights reserved.